Christmas is officially 10 weeks away! Wow! So to help you with your Christmas shopping this year, I will be bringing you any good deals I find that could help you cross a gift off your list. I have even added a label "Christmas" on the top menu bar of my blog. Just click there to check out the deals I post about Christmas gift ideas. Amazon has a great deal on this DVD set right now. 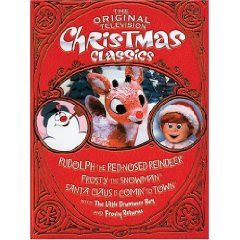 It includes these classic Christmas movies: Rudolph the Red-Nosed Reindeer, Santa Claus is Comin’ To Town, Frosty the Snowman, Frosty Returns, The Little Drummer Boy and a Bonus Holiday Music CD! Normal price on this is $39.99 but Amazon has it priced as low as $15.86. Even better if use swagbucks, you could redeem them for Amazon gift cards and use them to pay for this deal! For more information on joining swagbucks go here.